Woke up to a bit of snow today. Forecaster said we were going to have rain, rain, rain for the next week ... but I guess it was a little colder overnight than they expected and we got just a dusting of snow. Enough to cover the ground and make everything look pretty and bright. Sadly, the rain has just started, so the snow will be gone shortly. Good day to stay inside and play in the art studio - at least for the morning. The skills competition for the NHL is this afternoon and hubby and I will be watching that ... along with the All-Star game tomorrow - we LOVE hockey! On to the card for today. I just loved the Technique Lover's Challenge this week - (TLC361 - Inspired by Belleek Pottery) ... that I had to make one more card using this technique of inking an embossing folder with a very subtle color. I was inspired by Roxie's card (Rox71) on SCS this week. 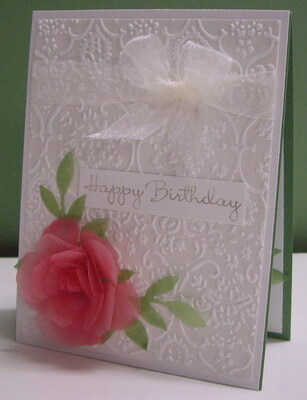 She used vellum layers to make a delicate flower and I used her idea to create the rose for my card. See Roxie's gorgeous card by clicking here. I started with the rose ... I cut out several layers of pink vellum in varying sizes. I sponged all around the outside of the petals and also in the very middle of the flowers with Regal Rose ink. I used my bone folder to curl the edges of each petal downward (with the exception of the smallest flower to be used for the center). I layered all the flowers together and threaded a brad through and secured the flower together. I bent the petals from the top (smallest) flower up, overlapping them and used a few drops of Crystal Effects to hold them together (center bud of flower). I they bent each flower upwards and then moved the layers around until I was happy with how it looked. I used the Little Leaves die-cut with the green vellum to cut out two sprigs. I sponged the edges of the leaves and up the stem with Garden Green ink. I used my brayer to add a light layer of Crumb Cake ink to the inside of my embossing folder, added a layer of Whisper White cardstock and ran it through my Big Shot. I trimmed it to size and then wrapped the sheer ribbon around the top, making a bow at the top, and off to one side (opposite side that the rose will be on). I stamped the sentiment in Crumb Cake ink onto Whisper White cardstock and trimmed to size. I wanted the sentiment to be very subtle and not take away from the rose focal point of the card. I assembled all the layers onto a Whisper White card front, using glue dots to secure the rose and leaf sprigs. I mounted the card front onto a card base of Wild Wasabi (doesn't show when looking at the front of the card - just for stability).